If you’re tired of doing endless crunches and you’re still not seeing the results you want, you may want to consider TRX. TRX is the perfect tool for carving out chiseled abs, since every TRX exercise is essentially a core exercise as well, as your core works overtime to keep you steady throughout each movement. 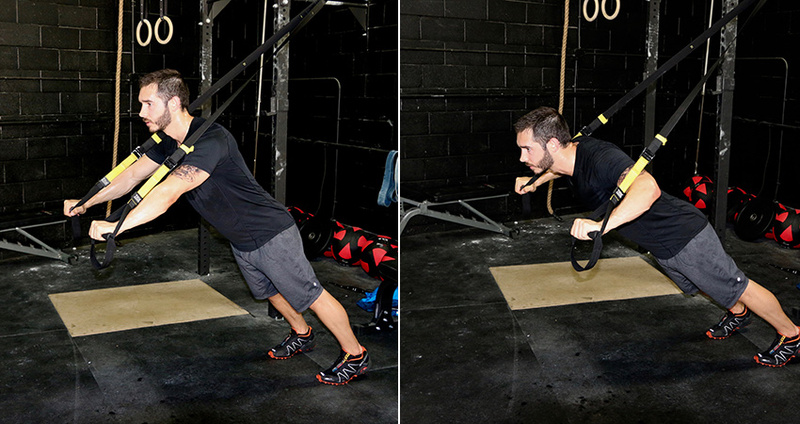 TRX requires two adjustable straps, which dangle from an anchor. You use them by either gripping the handles in your hands, or placing your feet in the foot cradles to create instability by removing contact with the ground. Chiseled abs are important, but TRX works other important muscle groups in your midsection as well, such as your obliques, lower abs and your lower back. Additionally, due to their suspension, TRX workouts can help improve posture, reduce or eliminate back pain and prevent injuries. Try one of the following TRX ab workouts to create definition, burn belly fat and improve your core strength. If you’re just getting started, try this workout. Since your hands are in the straps and your feet are on the floor you have a more stable base, so while these are still tough, you will have a little more control. Start with a handle in each hand facing away from the anchor. Step backward so that you’re in push-up position with your hands directly underneath your shoulders. Keep your belly button pulled in to keep the core activated. To begin: Keep your arms straight and hips in line — no bending at the waist — slowly move your arms overhead as far as you can while still remaining in control. Pull your hands back to push-up position and repeat. Start with a handle in each hand facing away from the anchor. Step backward so that you’re in push-up position with your hands directly underneath your shoulders. Keep your belly button pulled in to keep the core activated. To begin: Flex through the elbows to slowly lower your body toward the ground. Your chest should be between your hands, your hands hitting just at your shoulders, elbows back. Pause, then extend through the elbows to return to start. Start with a handle in each hand facing away from the anchor. Step backward so that you’re in push-up position with your hands directly underneath your shoulders. To begin: Keeping your hips down (don’t bend at the waist) bring your right knee into your chest. Explosively reverse the position of your legs, extending the right leg back, supported by the toe, and bringing the left knee up into your chest. That’s one rep, but keep the movements quick and continuous. Flipping around and putting your feet in the foot cradles makes ab exercises even tougher since your hands and your core are the only things holding you steady. It’s hard, but be sure to keep your upper body as stationary as possible. Get into a suspended plank position: face down, feet in the cradles, hands under shoulders, body a straight line from your head to your heels. Keeping your belly button pulled in and your legs straight, slowly bend at the waist and lift your hips toward the ceiling, piking. Pause, then open at the waist, bringing your hips down and back into plank position. Start in suspended plank position. To begin: initiating the movement with your obliques, slowly swing your lower body laterally to the right. Pause, then slowly swing the lower body to the left. That’s one rep. Move as far as you can to each side while still remaining in control. Start in suspended plank position. To begin: Flex through the elbows to lower your body into a push up. As you lower, simultaneously bring your right knee in to your right elbow. Pause, then extend through the elbows and bring your right leg back to suspended plank. Repeat, alternating legs with each push up. Trx exercise if very much preferable as it is one of the best ways to make abs perfect . And this is also necessary to know the workout of this exercise according to rules and maintain them regularly . In this case this the post shared here is very much tonic undoubtedly as per i see . This is great job and thank you author for doing such useful job .